As a guide, Helicoverpa kits are $106.20 each, plus GST & freight. Each kit comprises 2 green funnel traps each with a string hanger & pheromone holder, plus either 6 x H.armigera lures OR 3 x H.armigera lures & 3 x H.punctigera lures (prices correct as at April 2014). Indicate how many traps, and for which species of Helicoverpa you require lures. Which pheromones do you need? Monitoring pulses and canola in dryland cropping areas = only H. punctigera (native budworm) required. 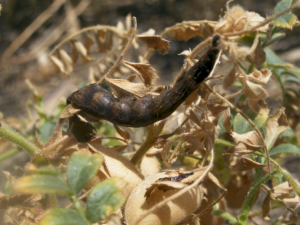 Copping area that is in proximity to irrigated summer cropping that may be hosting H. armigera. = both H. punctigera and H.armigera (cotton bollworm) traps are relevant. A lure has an effective field life of 6 weeks. Three lures should be sufficient for the spring trapping period (September – November). Watch a video on how to set up pheromone traps at the Beatsheet YouTube channel. View an online map of the Helicoverpa trap network catches. To look at insects found in the field more closely, hand-held microscopes are extremely useful. These microscopes also allow you to take high quality photographs that can then be mailed/messaged. There are currently two types of these microscopes available in Australia. The Dino-lite type which must be connected to a computer or tablet by USB, and the wireless versions that can be linked to tablet or smartphone. Both start at around $150 per device. Available as ViVus Max, produced by AgBitech. To download technical information on the use of NPV for the control of helicoverpa species, visit the AgBitech website.